We will be reuniting as “Celestial” for one night only to pay tribute to our dear friend Caleb Scofield. Please join us. Tickets on sale this Thursday 6.14 at 10am PT. The show, as you can see in the flyer above, takes place at The Wiltern in Los Angeles on Saturday, 10/13. A bunch of the bands on this lineup are also playing a Caleb benefit tomorrow in Boston (6/13). 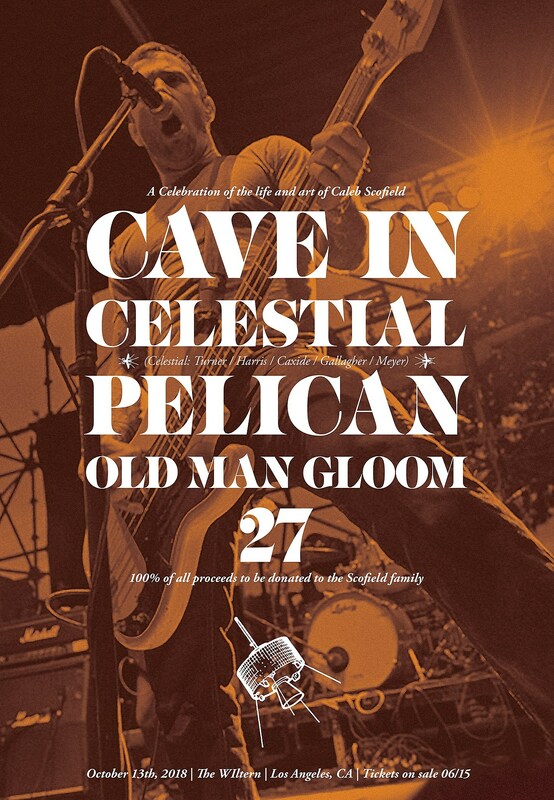 Caleb played in both Cave In and Old Man Gloom (with Aaron Turner of Isis). He died tragically in a car crash in March, leaving behind a wife and two kids. The flyer confirms that Celestial’s lineup will be Aaron Turner, Aaron Harris, Jeff Caxide, Michael Gallagher, and Bryant Clifford Meyer. That was Isis’ roster when they broke up in 2010. We recently looked back at “Oceanic” on its 15 year anniversary.